This month's wish list kind of ended up having a slight Valentine's Day influence and I'm perfectly okay with that! I'm one of those people who actually loves Valentine's Day because it's the perfect excuse to write sweet notes to those you love, and to dress up for a fancy date (or girls night). These items are all on my personal wish list, but would also make wonderful gifts to give or receive. I actually have a pretty minimal clothing wish list this month (crazy) because I don't want to buy anything more for winter, but I'm waiting for cute spring things to come out. However, I've wanted a pair of dark wash, distressed skinnies for months, and finally found a great affordable pair at American Eagle. I've also been doing a lot of online shopping the last couple of days looking for the perfect skirt or dress for Valentine's Day since the one I ordered didn't really work out. 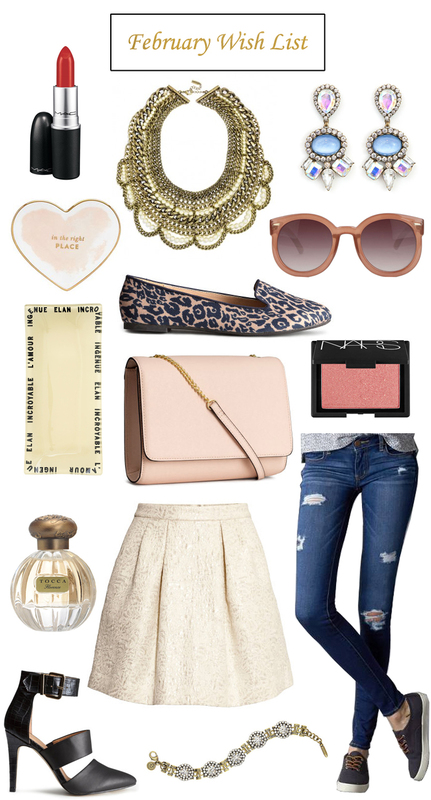 I've actually already purchased both pairs of shoes above, as well as that adorable blush clutch bag. Something to note though... I [surprisingly] had never bought shoes from H&M before and was shocked that my normal size (9.5) is a European size 41 there (usually a 10-11), so both pairs were Really big on me! Needless to say I'm exchanging them both for the next size down because they're really great for the price. Just know that their shoes do run big. I also came across those plum sunnies from UO and they're a great price and will be so cute for spring! There are seasons where I happen to not like very much of the jewelry out, but this season that is so not the case. I'm not typically a statement necklace type of girl, but that BaubleBar bib necklace has stolen my heart! Since discovering it, I've seen it on a few of my favorite bloggers and that has just confirmed how much I love it. If I'm good with my spending this month I think I'm going to treat myself to it! As for the Loren Hope jewels... I love absolutely everything they design and am slowly building up my LH collection through my RocksBox subscription. I just received that bracelet in yesterday's new box and I will definitely be keeping it, and I've put those ah-mazing earrings on my RocksBox wish list because I think they're stunning! My home wish list is actually pages and pages long because we need and want so much still (I think it will probably take a few years to fully furnish and decorate everything). However, I do really want a little ring dish and/or jewelry catchall for my nightstand. Both of these options are so sweet. Beauty is an area where I really have to watch my spending because I often find myself walking out of Sephora spending twice as much as I had planned. There are just so many products I want to try! I am close to being in the market for a new blush and want to try a new brand. I've heard great things about NARS and MAC - do you have any thoughts on those or recommendations for other brands? I also want to purchase a new perfume in the next few months... I'm a sucker for pretty packaging but know very little about fragrance. What's your favorite/signature fragrance? I want to make a list to try out in-store. And finally, I've decided that I want to buy only nice lipsticks and stains and cut down my collection to a handful of signature shades. Simplify basically! The next shade I'm on the hunt for is a signature red lip so I'll be heading to the MAC counter soon to find one.